Most people have their favorite comfort foods. I have comfort “authors”. These are the authors I pick up when nothing else appeals to me, when, for whatever reason, I can’t find a book that grabs me. That’s when I go to one of my comfort authors, knowing I’ll fall into the story. And one of my comfort authors is Barbara O’Neal / Barbara Samuel. I love her books; it is that simple. Which, brings me to my latest Barbara O’Neal read: The Art of Inheriting Secrets. I stayed up late to finish it, and afterwards, while laying in bed thinking about her story (rather than sleeping), I realized what sets her books apart for me. Yes, she’s an excellent writer who tells good stories with really unique characters who I’d love to know. But she does something else exceptionally well that is not as obvious; she makes you fall in love with her settings. Then, she creates a community within that setting that you want to be part of. It’s so subtle and masterfully done that even with all the books of hers I’ve read I didn’t realize it until now. 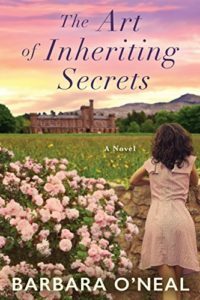 In the Art of Inheriting Secrets, she takes you a sensory voyage of sights, sounds, tastes, and smells to an English village—current day—with a great aging manor house, expansively green fields, exquisite food, and wonderful characters. I so want to go there. So, when you couple this with the excellent writing, story, and multi-layered characters, she’s once again produced a story world I didn’t want to leave. Sally, I’m so sorry to hear about your dog. It is like losing a family member. As for Barbara’s books, I got hooked years ago with In The Midnight Rain. I think she originally published under the pseudonym Ruth Wind. It’s a wonderful book. So, what was your first of her books?